Fashion laden with a youthful culture of graffiti was showcased at the second Seoul 365 Fashion Show on Wednesday at Seoullo 7017, Jung-gu. 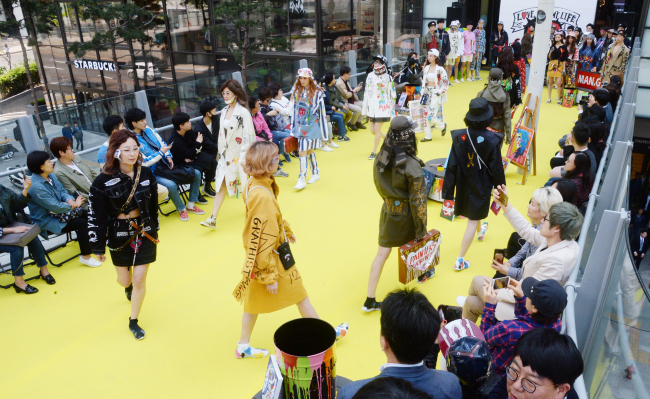 The Seoul 365 Fashion Show links Korean fashion with Seoul City’s iconic locations where foot traffic can give more exposure to the fashion show. This show’s dominating concept was graffiti, a form of art that often represents youth culture and spirit. Graffiti-inspired apparels by designer man.G were put up on stage accompanied on the sides by colorful drawing performances.